Edythe F. Wright’s artistic practice concentrates on the examination and critique of material culture. As head of the Institute of Domestic Archaeology (IDA), she applies methodologies such as dissection and magnification in the pseudo-scientific study of domestic objects, exposing hidden contradictions and apparent significance. 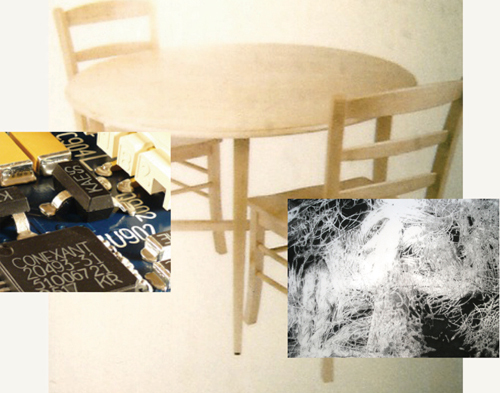 For the MEME residency, the IDA will deconstruct and study a set of ordinary household furnishings. Accompanying the investigative activities will be a display of the work "A Place Called Inspiron®" as well as two drawings of massively enlarged stuffed animal fur. Edythe Wright lives and works in Boston. She earned her MFA at the Museum School/Tufts University, and BFA at Rhode Island School of Design. Her work has been exhibited at The DeCordova Museum (MA); The Rose Art Museum at Brandeis University (MA); Sarah Doyle Gallery, Brown University (RI); Open Square Gallery (MA); The Firehouse Gallery (VT); Lillian Immig Gallery, Emmanuel College (MA) White Columns Gallery (NY); Oni Gallery (MA); Mills Gallery (MA); Bernard Toale Gallery: Boston Drawing Project, (MA); Mobius, (MA); the Artists' Foundation, Boston and other spaces. Wright received a LEF Foundation Visual Artist Grant in 2005, a Massachusetts Cultural Council Artist Award for sculpture in 2003, a Tenot Bursary (grant) and a TransCultural Exchange Travel Grant in 2008. She is a founding member of the Fifth Business Curatorial Collaborative.